Indoor cycles, commonly known as spin bikes, can make a great addition to your home gym. In order to find the best spin bike for your needs though, it’s important that you have a basic understanding of what makes these exercise bikes tick. Knowing which features and specs to compare when looking at indoor cycles will make all the difference between you being happy with your new bike and your cycle getting lonely in the corner collecting dust. This comprehensive review will teach you everything you need to know about spin bikes. I will also present you with my top spin bike picks for the year. After reading this, you should feel confident in your search for the perfect indoor cycle. In case you’re in a hurry, I’m going to start with the discussion on the best spin bikes. But I strongly encourage you to read to the end, it’s important stuff people! Peloton has been around since 2012 and they now have a treadmill and online fitness app: but it all started with their bike. You’ve probably seen the commercials on tv or online, they’re pretty much everywhere. It all revolves around the idea of bringing the experience of participating in a spin class from the comfort of your home. It’s a brilliant idea and one Peloton has executed perfectly in my opinion. I own a Peloton and am happy to say I’ve been participating in 2-3 classes a week since my wife surprised me with one for my birthday. But besides the online courses (which are amazing by the way), the bike itself can hold it’s own with any elite indoor cycle on the market. With a sophisticated magnetic resistance system and low maintenance belt drive train, the Peloton bike offers a near silent ride. Adjusting the resistance is achieved by easily turning the resistance dial. I like that the resistance is measured in terms of percentage, ranging from 0 – 100 (the total resistance provided is a lot, I rarely get above 60 and that’s with standing). This bike uses LOOK Delta clip-in shoes, so cleats are necessary. There is no shoe cage option for sneakers. The seat is fully adjustable. The only downside (besides having to pay the monthly subscription of $39) is that the handlebars don’t have a fore/aft adjustment. Otherwise, the Peloton bike is a class act all around. The star of the show is obviously the huge, 22″ flatscreen tv they use for a monitor, which is also touchscreen. Tracking your stats and watching the workouts is a cinch with this beautiful screen. The system is bluetooth and ANT+ compatible for chest strap heart rate monitors and wireless earbuds. It’s also backed by a decent warranty. 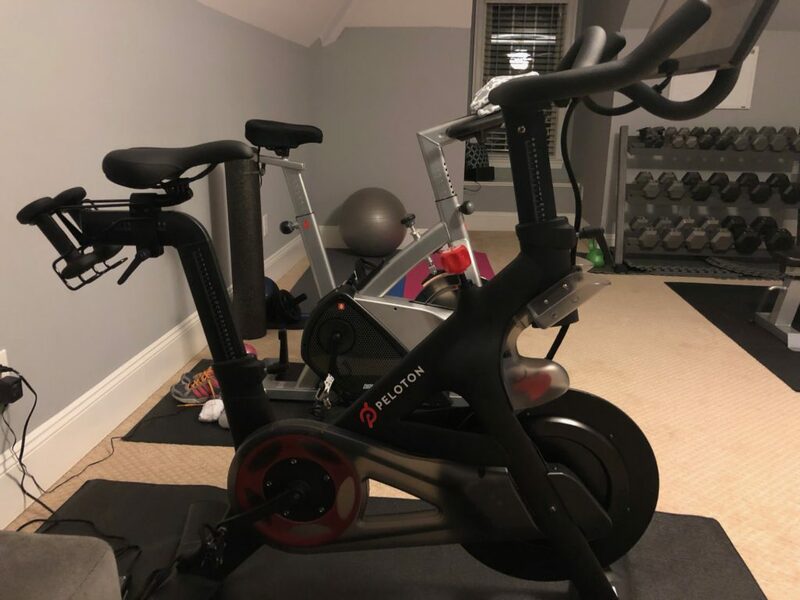 Overall, if you’re looking for a luxury spin bike that can turn your home into a spin studio, the Peloton is the way to go. See full review. The Keiser M3i always finds itself at the top of “best of” lists because there’s really no room for subjectivity here- it’s simply one of the best 3 indoor cycles on the market. It’s also probably the best looking spin bike you’re gonna come across. I mean seriously, it looks like a piece of art, gorgeous. But looks aside, the specs are just as impressive. The M3i is one of only a few elite cycles that utilizes a lightweight flywheel. And when I say light, I’m talking 8 lb light. Keiser believes that if your magnetic resistance system and drive train are engineered adequately enough, you don’t need a huge flywheel to achieve a smooth feeling ride. Users seem to agree because there aren’t any complaints about the feel of this bike. With an automotive grade belt drive system and eddy current magnetic resistance, the M3i can provide as smooth and silent a ride as any. You’ll also notice that the flywheel is positioned in the rear of the bike. Keiser was the first brand to do this. It looks awesome, but it also serves a purpose- to protect the flywheel from corrosive sweat. Smart thinking Keiser. The M3i also comes with a fully adjustable seat, fully adjustable handlebars, and a uniquely designed “V” shaped frame. Again, this elegant design feature serves an important function- it allows this bike to accommodate users anywhere from 4’10” to 7′ tall. And with a surprisingly high weight capacity of 350 lb, it guarantees almost anyone can comfortably ride this bike. The bluetooth enabled monitored is actually pretty sophisticated for spin bikes, but it looks like something from the stone ages when compared to the Peloton. Of course you don’t have to worry about an ongoing monthly subscription with this bike either. If the M3i has an Achilles’ heal, it’s the warranty. Otherwise it’s nearly perfect. If you are looking for an elite indoor cycle without the ongoing monthly fee, the Keiser M3i is a smart choice. See full review. Schwinn’s AC Performance Plus is another usual suspect when it comes to the best of the best. This bike often finds itself being compared to the M3i and everyone seems to have their favorite. Picking a clear cut winner between the two is tough and it really comes down to which features are most import to you. Honestly there, it’s like trying to decide between Tyson and Ali- there’s no wrong answer. When it comes to the flywheel, Schwinn is a little more old school. This bike is packing a 37 lb perimeter weighted flywheel that should be more than enough to provide a smooth ride. I’ve read reviews from elite cyclists that say they prefer the feel of a heavy flywheel to a lighter flywheel- that said, if you aren’t an avid cyclist, you may not be able to tell the difference. Either way though, the AC Performance Plus has you covered. The heavy flywheel is paired with a magnetic resistance system to provide all the resistance you will ever need, regardless of your fitness level. The standard version of this bike comes with a chain drive, but you can opt for the upgraded carbon blue belt drive system for additional cost. Even with the extra cost, this bike is in the same price range as the M3i (and a little under that of the Peloton). The AC Performance Plus comes with a fully adjustable seat, fully adjustable handlebars, and Schwinn’s double link pedals that are compatible with both sneakers and SPD cleats. All this sounds great, but to make it even greater Schwinn backs this bike up with a monster of a warranty. With a 10 year frame warranty, the AC Performance Plus has one of the best warranties on the market. The only downside I can think of for this bike is that it doesn’t come standard with a monitor. You can purchase one separately, but for this price it would be nice if Schwinn threw one in. Overall though, the AC Performance Plus is a heavy-duty indoor cycle with great specs and an awesome warranty. If you’re looking for a serious spin bike that will last, this is a smart investment. See full review. Even though Sole started out producing fitness equipment for hotel chains, they’ve rapidly made a name for themselves in the home fitness game. You may know them for their popular treadmills, but their spin bikes deserve just as much praise. The SB900 is their highest-end indoor cycle and it has some pretty remarkable specs. Starting from the beginning, this bike comes with a very heavy, 48 lb flywheel. For the cyclists out there that love the feel of a heavy flywheel spinning, this bike is going to make you very happy. To go along with this massive flywheel, the SB900 utilizes a belt drive train and magnetic resistance system. The result is a quiet, smooth ride that can compete with the top 3 bikes mentioned above. This is probably a good time to mention that this bike also costs half of what the top 3 bikes listed above cost. To round out this bike, Sole includes a fully adjustable seat and handlebars, making this bike completely customizable. If the SB900 is sparking your interest already, wait until you hear the best part: Sole offers a lifetime warranty on the frame (as well as 3 years on parts)! This is an amazing warranty. It blows away the great warranty Schwinn offers, mentioned above. The SB900 is actually warranted for light commercial use too, which shows how well built this machine really is. The only department this bike is lacking in is the monitor. It does include one, but it’s just a small, LCD screen that shows the regular metrics. Nothing fancy. Dollar for dollar, the SB900 is one of the best buys out there. It has all the specs to compete with the elite cycles and Sole offers a much better warranty than anyone else. Truly a great spin bike. See full review. Life Fitness is a very well-known provider of commercial grade fitness equipment. Their products are found in popular gyms around the country, but they also have a line of home fitness equipment. They offer several indoor cycles at different price points. The IC6 is one of their higher-end bikes. Looking at this bike, the first thing that pops out to me is how elegant it looks. It has a sleek, rear-flywheel design, similar to that of the M3i. Speaking of Keiser, Life Fitness followed suit when they designed the IC6- this bike also uses a very light-weight flywheel (only 9 lb). There must be something to this strategy because users agree the IC6 offers a smooth, seamless ride experience. In order to make a light-weight flywheel work, it’s necessary to have a drive train that’s designed correctly. The gear ratios have to be exact in order allow that flywheel to reach high speeds. It’s also important to have a magnetic resistance system that can keep up- the IC6 has both. Using an automotive grade belt drive, the IC6 can provide a smooth and quiet ride without the extra bulk of a heavy flywheel. Which definitely comes in handy when it’s time to move this thing. This bike also features fully adjustable handlebars and seat, as well as dual-sided pedals that can be used with sneakers or cleats. Life Fitness must’ve used some of their commercial grade tricks when they built the IC6, because the heavy-duty frame can hold users up to 330 lb, making this bike usable for larger folks as well. The IC6 comes standard with a pretty sophisticated monitor as is, but if you want to upgrade to the MyRide console it’ll cost you a couple hundred bucks more. The upgraded monitor works as a tablet that allows you to follow along with different workouts- sort of like the Peloton app, but the workouts aren’t live and there’s a limited quantity (but no monthly fee). Last, but not least, the IC6 is backed by a pretty generous 5 year frame warranty (3 year parts). For the price, it would be nice to see a longer warranty, but this is pretty par for the course when compared to the rest of the competition. Overall, the IC6 is an advanced home indoor cycle, very comparable to the M3i. If you’re looking for a robust bike with some impressive tech, this is a good choice. See full review. I mentioned earlier that Sole offers 2 indoor cycles, well, here’s the other one. I think it says something when all of a brand’s spin bikes make my “best of” list…it means Sole knows what they’re doing. The SB700 is actually very comparable to the SB900. The biggest differences are found in the resistance system, the pedals, and the price. This bike uses the same 48 lb flywheel the SB900 uses. Again that’s a massive flywheel for any spin bike, but for one in this price range it’s almost unheard of. I know Sunny Health & Fitness also likes to use really heavy flywheels, even on their budget bikes. So, the first big difference is found in the resistance system. The SB900 uses a frictionless, magnetic resistance which is almost silent during use. The SB700 uses a felt braking resistance system. This doesn’t cause much more noise, but it does make for a little extra maintenance. Over time, that felt pad is going to break down and have to be replaced. With magnetic resistance systems, there is no friction (no touching parts), so maintenance is really minimal. Magnetic resistance is superior to brake pad resistance in every way, but it increases the price of the bike. The other big difference is found in the pedals. The pedals on the SB700 are caged only. This means they are only compatible with sneakers- no clipping in with cleats. You could easily switch out the pedals if you wanted to, but if you didn’t already own some you would have to pay for the extra cost of the pedals. Everything else is roughly the same as the upgraded SB900- this bike also comes with fully adjustable everything and a heavy-duty frame. Last is the price. Considering the brake pad resistance system and caged only pedals, Sole decided to price the SB700 $200 less than the SB900. I think this is a pretty fair price for this bike, considering it comes with the same incredible warranty as the SB900 (lifetime frame). See full review. The Diamondback 510Ic has a special place in my heart because it was the first spin bike I purchased. Even though we now have a Peloton bike too, the Diamondback still gets its fair share of action when me and my wife are riding together. We take turns with who gets the Peloton and the other rides the 510Ic. I’ve gotta say, even when compared to the best, this bike still offers a really smooth ride. Especially considering the fact that this bike costs almost $1500 less. Anyway, let’s get down to the specifics. The 510Ic comes with a 32 lb flywheel, so a little lighter than some of the other bikes on this list, but still plenty of weight to produce a smooth motion throughout the entire pedal stroke. I doubt many of us could tell the difference between a 32 lb and 37 lb flywheel anyway (I’m sure I couldn’t). This bike also uses a magnetic resistance system, which keeps your rides smooth and quiet. I can (and have) watch tv while I ride without any issues. One of the biggest reasons I decided to buy this bike over some of the other comparable options was the fact that the 510Ic comes with preprogrammed workouts. 12 of them to be exact. I also liked that the resistance was controlled through the monitor- 16 levels adjusted by touching a button up or down. This bike has a fully adjustable seat and height adjustable handlebars. The pedals are caged (so no cleats). The frame is really heavy-duty, doesn’t rock at all during use. It can hold folks up to 300 lb safely. The warranty on this bike is also pretty solid- 5 years on the frame, 3 year parts, and 90 days on wear items. The Diamondback 510Ic is priced similarly to the Sole SB700 and the 2 bikes have a lot in common. If you’re looking for a solid mid-range spin bike with magnetic resistance and included workout programs, the 510Ic is a smart buy. See full review. Schwinn lands another indoor cycle on this list with their significantly more affordable IC3. At well under $500, it’s fair to call this a “budget” spin cycle, but the specs this bike is boasting are anything but. Starting from the top, this cycle has a 40 lb flywheel. This is very heavy for any grade of spin bike. The extra weight helps the IC3 provide a smoother ride than you’d expect from such an affordable cycle. This bike uses a felt brake pad resistance system. I mentioned above that this type of resistance isn’t as sophisticated as magnetic resistance- it’s cheaper and more prone to wearing down with time. On a budget cycle though, it’s not surprising to see brake pad resistance. What is fairly surprising though, is that the IC3 uses a belt drive train. Belt drives are superior to the traditional chain drives because they are quieter and require less maintenance. Belt drives are usually reserved for the more expensive bikes, so it’s awesome to find one here on the IC3. Both the seat and handlebars on this cycle are fully adjustable. With a max weight capacity of 300 lb, this affordable spin bike is adjustable enough to fit just about anyone. The IC3 also comes with dual fit pedals, meaning you can use cleats if you want or sneakers if you prefer. This is another surprising feature we rarely see on bikes in this price range. With wireless heart rate monitoring capabilities and a great warranty (5 year frame, 2 year parts), the Schwinn IC3 is easily one of the finest indoor cycles in the under $500 category. If you’re on a limited budget, this bike is a smart bet. See full review. Finishing up the list is the Evolution Pro by Sunny Health & Fitness (SHF). I’m a fan of SHF because they’ve mastered the art of producing budget friendly equipment that looks good and actually works. Their products are always highly rated by users and they often find themselves on “best of” lists such as this one. The Evolution Pro is no different. At 44 lb, this bike has one of the heaviest flywheels on this list. Besides the Sole cycles listed above, I can’t think of any indoor cycle with a heavier flywheel off the top of my head. For the cyclists that love the feel of a heavy flywheel, the Evolution Pro is sure to satisfy. This heavy wheel is combined with a magnetic resistance system and belt drive train to produce an exceptionally quiet ride. This bike is more than capable of providing an intense workout for users of all fitness levels. The Evolution Pro also comes with fully adjustable handlebars and a fully adjustable seat, giving you full customization of your fit. One of this bike’s most impressive specs in my opinion, is the weight capacity of 330 lb. This bike is designed to accommodate users of all sizes and the extra weight capacity ensures larger folks can ride safely too. The frame is very robust for a bike in this price range. The pedals on the Evolution Pro are standard caged style. They’re designed to be used with sneakers, but you could easily swap them out for SPD pedals if you want. The biggest flaw on this bike is found in the warranty department. The Evolution Pro only has a 3 year warranty on the frame and a 6 month warranty on parts. This isn’t awful, when compared to some of the warranties offered by the more expensive bikes, but it would be nice to see a little longer on the parts. That said, SHF warranties tend to be on the short side. Oh well, nobody’s perfect. Overall though, the Evolution Pro has all the specs to compete with the highest-end spin bikes on the market. And at a price that is roughly $1500 less than the elite cycles, this bike offers one of the best “bang for your buck” ratios around. See full review. Ok, so “spin bike” and “indoor cycle” are two terms for the same product. “Indoor cycle” is actually the proper name for these exercise bikes. Mad Dogg Athletics was the first brand to use the “spin” or “spinning” name for their bikes and they actually trademarked the phrase. But these days the terms spin bike or spinning bike have become so generic that they’re used interchangeably with indoor cycle. But, because of their trademark, other companies aren’t allowed to call their cycles “spin bikes”, only Madd Dogg. Semantics aside, an indoor cycle is a style of exercise bike designed to closely mimic the feel of riding a road bike. They were created and designed by Johnny G. and John B. who eventually came together to create Mad Dogg- as well as the idea of exercise classes based solely on riding a spin bike. Johnny G. was an elite cyclist who had an accident while riding at night. Instead of chancing fate again, he decided to come up with a way to ride a road bike indoors. The rest is history. Indoor cycles are pretty minimalistic when compared to traditional upright bikes and recumbent bikes. There’s usually less “stuff” you don’t need to operate the bike (like speakers and cooling fans). A lot of these cycles don’t even come with a monitor. If you’re new to spin bikes, that’s ok. This section will walk you through all the specs and features you should consider when comparing different cycles. At first glance, a lot of bikes will appear very similar. In order to find the best buy, you have to take a close look at the fine details. If you made it through the descriptions of each bike above, you have a good idea of how important the flywheel is to an indoor cycle. It’s really the heart of the bike- it gives the bike it’s “feel” as well as provides the mechanism to create the resistance. Flywheels come in all different sizes (all the same shape though, can’t say I’ve ever seen an oval or square one). The weight of the flywheel is usually the first question people ask when researching a bike. The traditional belief is that heavier flywheels provide smoother, more realistic rides. These heavier, “perimeter weighted” wheels build momentum as you pedal. This momentum keeps the pedals moving smoothly throughout the entire 360° pedal motion. Cheaper bikes with lighter flywheels can sometimes have “choppy” pedal motions because there isn’t enough momentum to keep pedals moving smoothly. These days most quality spin bikes come with flywheels that are at least 30 lb. That seems to be the cutoff of what is considered a “heavy” flywheel. Don’t asked me who made that rule. But a lot of brands are including flywheels much heavier, as you may’ve noticed. It’s not uncommon to see 40-50 lb flywheels these days. I italicized the word “most” above because there’s another school of though that is gaining some serious momentum. The idea that you need a heavy flywheel to get a smooth ride is being challenged by some of the highest-end brands. Names like Peloton, Keiser, and Life Fitness are all producing indoor cycles that use flywheels under 10 lb. The idea being that if you have a sophisticated magnetic resistance system and a properly designed gear system you don’t need all that extra weight to get that smooth feel. I can tell you from experience it’s true. Although I’ve read interviews from elite cyclists who’ve trained with both and still prefer the feel of a heavy flywheel. According to some, it provides an experience that more closely resembles riding outside. Regardless of weight, the flywheel is usually found in the front of the bike. But there are a few models now that are putting the flywheel in the rear of the cycle. This looks cool, but it also serves to protect the flywheel from sweat damage during use. We can all thank Keiser for this innovation. The type of drive train is another spec that you may want to consider. This one isn’t as crucial as flywheel weight, but it can make a difference in your ride experience. First of all, the drive is what connects the pedals to the flywheel. On a road bike, this is the chain (chain drive). Indoor cycles also use chains, but now we are also seeing belt drives. Chain drives work great, but when compared to belts they have a few disadvantages. First, the chain drives make a little more noise than the belts because you can hear the “clanking” noise the teeth make as the gear catches the chain links. Belt drives are basically silent. Second, chain drives should be lubricated regularly to ensure smooth operation. Most quality belt drives require no maintenance (unless the unlikely should happen and the belt snapped). Bikes with a belt drive are usually a little more expensive than their chain counterparts, but now even some of the more budget friendly models are starting to use belts. If you are looking for quietest, smoothest ride possible, you should look for a bike with a belt drive. If you are looking for a bike that works great, but is a little easier on the budget, a chain drive will do just fine. Keep in mind, chain drives work just as well as belt drives. The noise and maintenance factors are the only difference. The seats on indoor cycles are usually pretty uncomfortable- that’s just the way it goes. Most indoor cycles use standard road bike seats. Because of their narrow shape, they tend to put more pressure on your bottom than the wider seats used on standard upright bikes. This is a common truth with all spin bikes. The important thing to consider about a spin bike seat is whether or not it’s fully adjustable. Fully adjustable means you can adjust the horizontal position of the seat (fore/aft) as well as the height. Being able to adjust the fore/aft position gives you a much better chance of finding the right fit. This is especially important on a spin bike because you are usually riding at higher speeds and intensities. If you’re riding often with in improper fit, the chances of you getting injured are more likely. It’s also not going to feel as comfortable, which could hinder your workouts as well- it’s difficult to go for a long ride when you aren’t comfortable. The handlebars on a spin bike should be multi-grip. This gives you the ability to change the position of your hands throughout your ride. This is important because you will need to change your grip depending on what type of workout you’re doing: your hand position changes depending on whether you’re standing or riding a “flat road”. Multi-grip handlebars come in all different shapes and sizes. A lot of handlebars are also fully adjustable (height and fore/aft adjustments possible), although not all are. If you’re looking for the most customizable fit possible, look for a bike with a fully adjustable handlebar. Surprisingly, neither of the indoor cycles I own have a fully adjustable handlebar and I have been fine. For me, the most important spec regarding the frame is the max weight capacity. Pretty much all frames are made out of steel and aluminum, but the weight limit gives you an objective measure of how “tough” a bike is. I think you should aim for a bike with at least a 300 lb weight capacity. Even if you’re only 150 lb, a bike that can handle that much more weight is going to feel a lot more stable during use. The bikes that can handle users in the 300-350 lb range are more robust and more sturdy. They are going to feel more like a commercial grade machine when you step up on them. The last thing you want is your bike swaying or wobbling during your workout. I’ve read reviews where users complain about how heavy their spin bike is. Personally, I want my bike to be heavy- it usually means the bike is more robust and more stable. If you’re looking for a spin bike, the monitor shouldn’t be the first thing you consider. After all, spin bikes aren’t known for their hi-tech monitors (unless you’re Peloton of course). But if you’re stuck between two different bikes, the monitor may be the tie breaker for ya. Most indoor cycles come with very simple monitors that only consist of a small, LCD screen. Most only track the most basic of metrics, including: time, distance, cadence, speed, and calories. More advanced monitors are compatible with wireless chest strap heart rate monitors- definitely something you should consider if you like to track your heart rate. A lot of spin bikes don’t come with preprogrammed workouts, but some do (like the Diamondback 510Ic). If you want a bike with workouts included, know that it’s possible to find them. Many indoor cycles don’t come with a monitor at all. If you plan to watch tv or watch online workouts, you may not need a monitor. You can also purchase bike computers separately to track cadence and other metrics. I’m a stickler for warranties regardless of what type of fitness equipment you’re looking for. I think warranty is one of the best indicators of product quality. Nicer equipment should come with better warranties. This isn’t always the case. The frame warranty should always be the longest of the bunch. After all, if the bike frame breaks down before anything else you’ve got some serious issues going on. Good frame warranties should be somewhere between 5-10 years. Great frame warranties are lifetime. Good parts warranties are 3 years or longer. Some companies may offer 3 years on the mechanical and electronic parts but only 1 year on the wear parts. Labor is always the shortest of the bunch because it’s just isn’t cost efficient for companies to be paying third party contractors to re-build their products years after they were purchased. Even the best warranties rarely have a labor warranty longer than a year or two. I’m a realistic guy. I know price is usually the first spec we look at when searching for a new anything. The truth is we can only purchase something that fits into our budget. Luckily, spin bikes come in a wide range of price points. $200 – $500: these are the budget bikes, but that doesn’t mean you can’t get a lot of great features. You can find heavy flywheels and fully adjustable seats and handlebars in this group. Most of these are using chain drives, but some near the $500 range will be using belts. $500 – $1000: these are the mid-range bikes and probably where you’re going to get the best bang for your buck. You get a great spin bike for this budget, including heavy flywheels, magnetic resistances, and belt drives. You can also find great warranties here. $1000-$3000: these are the high-end, luxury bikes. Not only should you be expecting pretty much fully-adjustable everything, but in this price range you should expect clipless pedal options and advanced monitors. This price range holds the nicest spin bikes on the market. Now you know what to look for in a spin bike, but is a spin bike right for you to begin with? Maybe I should’ve started with this section. Oh well. Indoor cycles offer a great workout. With their ability to produce heavy resistance and reach high cadences, they are great for interval training and HIIT workouts. But they are also the least comfortable type of exercise bike. Stationary and recumbent bikes are a lot more comfortable to use. The heavy flywheels take a little more energy to get started and standing up on them can add extra stress through your knees and hips. 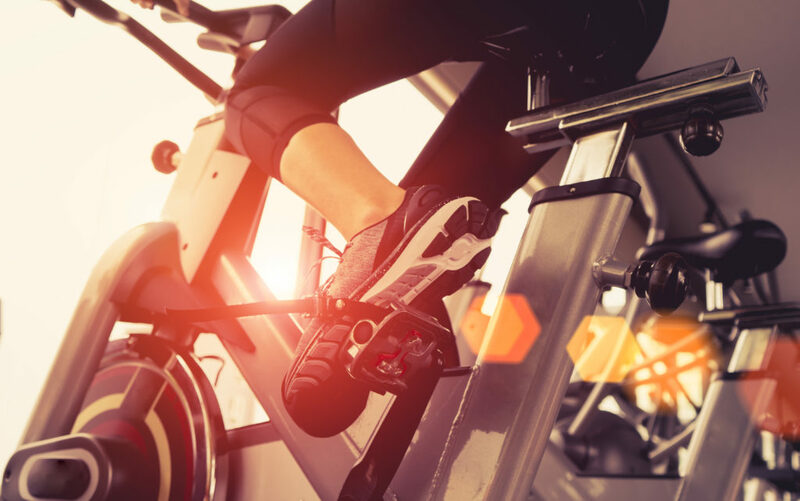 If you have joint issues or are prone to overuse injuries, you may want to think twice before diving in with a spin bike purchase. I would also think twice if you’re just looking for an exercise bike to use for casual workouts. Spin bikes are designed for intense, calorie torching workouts. You can obviously workout any way you like with your own bike, but if you aren’t interested in these types of workouts, it might make more sense to go with another type of exercise bike. Can you switch out the crank arms on a spin bike? Yes you can, and I have. It’s actually pretty easy on most indoor cycles. You will likely need a crank puller tool, but they are cheap and easy to find. All you have to do is remove the plug and bolt holding the crank arm attached. Then you will use the crank puller to separate the crank arm from the bike. There are some great videos on youtube that walk you through it. It only takes a few minutes. How can I make the spin bike seat more comfortable? There’s really only 2 ways to improve the comfort of a spin bike seat: replace the seat or add a seat cushion. Most spin bikes use standard road bike seats, which means you can easily swap them out for an upgraded seat bought separately. A cheaper option would be to try a gel seat cushion. I used this one on my Diamondback and it really helped a lot with the comfort. If you’re new to cycling, do know that with time you will get more used to the feel of the bike and your bottom will get accustomed to riding, which will make it feel more comfortable. Can the pedals be switched out? Yup, they sure can. Just like the seat, any quality spin bike will be using standard pedals that can easily be swapped out for another pair of your choosing. This comes in especially handy if you find a great bike you love, but the pedals aren’t compatible with cleats. Instead of starting your search all over, you could purchase your favorite bike and simply swap out the pedals. Can spin bikes be assembled by 1 person? I guess this really depends on your size and level of handiness. But generally speaking- yes, most spin bikes are pretty easy to assemble with only 1 person. The flywheel/drive train component all comes fully assembled. You basically have to attach the stabilizers, handlebars, seat, pedals, and console. Depending on how advanced your console (monitor) is, you may have to snake a wire through the handlebars and make a few connections. Most indoor cycles can be fully assembled within 30-60 minutes. How heavy are spin bikes? This depends on the make and model, but generally speaking, most quality spin bikes weight between 100 – 140 lb. Keep in mind the flywheel alone on some of these bikes weighs 40 or so pounds. This makes them a little front heavy, so keep that in mind when moving them. They all come with transport wheels, which makes moving them a lot easier too. You just have to tilt them forward on the wheels and wheel them to their next location. How much floor space to spin bikes take up? This may vary a little depending on the bike, but most spin bikes only require a footprint of roughly 4′ (L) x 2′ (W). This makes them amongst the smallest types of home fitness equipment and great for homes with limited space. What type of maintenance is necessary on a spin bike? All brands will have specific instructions for their bikes when it comes to maintenance. Generally speaking, you should wipe any sweat off the bike after each use because it can be corrosive to the frame and parts. You should also make sure all bolts are checked periodically to ensure nothing is coming loose, including the pedals (I had an issue with one of my pedals on the Diamondback that probably could’ve been avoided if I had checked them regularly). If your bike has a chain drive, you should lubricate periodically to keep it running smoothly. Belt drives shouldn’t require any lubrication. Otherwise, check the user manual for specifics. What heights can a spin bike comfortably accommodate? This varies greatly on the make and model of the bike. Most spin bikes can comfortably accommodate people anywhere from 5’2″ to 6’4″, but we’re all built differently. Checking the inseam height availability of the seat can give you a good idea. The Keiser M3i claims that because of its unique V-shaped frame, it can hold folks anywhere between 4’10” and 7′ tall- which is pretty remarkable.